14th December 2-7pm AWG Holiday Bazaar in the Al Bahja Hall at the Jungle Restaurant in Qurm Park. OR1.000 - kids under 12 free. Live performance by 4 members of the Oud Hobbyist Association at 5pm. 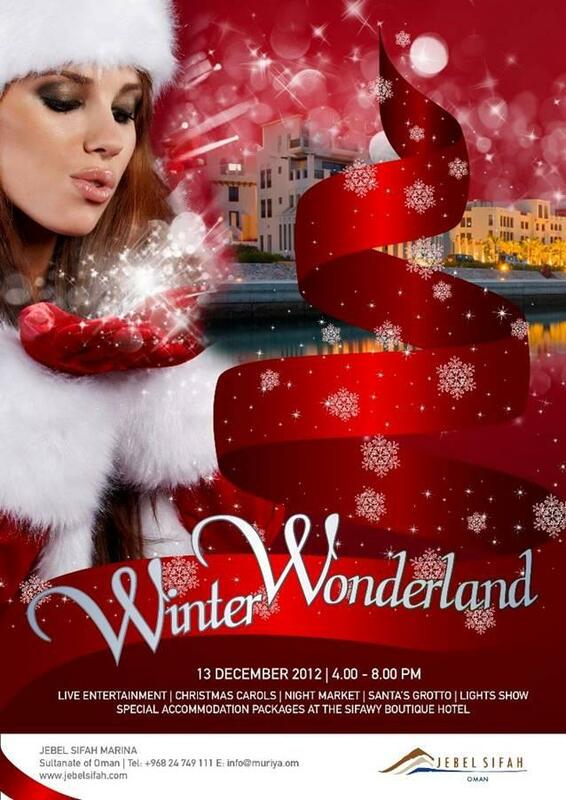 Christmas Carols, live entertainment, Santa's Grotto, Night market and a light show, on the 13th December. Christmas tree lighting ceremony - December 16th at 6pm. Christmas tree lighting ceremony - Tonight (December 8th) at 5pm. On Friday the Muscat Singers will be singing Christmas Carols in the main lobby at 4:30pm. Carol Service on 16th December at 5:30pm. Tickets available to UK Nationals and their families only, click here to get a ticket. Christmas Tree Lighting ceremony - Tonight (December 8th) at 7pm. Ooops! Well you snooze you lose! Wow- the British Embassy managed to stay open long enough to do something quickly!